Since graduating with a first class degree from Edinburgh College of Art, I have worked in large and small practices, with architects, surveyors, lighting architects and interior designers. I have been lucky to work with some brilliant and talented people along the way, in a breadth of sectors on projects ranging from banks to breweries, chapels to competition entries and hair salons to houses. I like to consider how a design works, how space may be occupied and how materials or surfaces may interface. I like to pour over forming that simple, satisfying detail and revel in the pursuit of a design, whether it be an over-arching concept, an historic reference or some good-old Grand Designs precedent. All in all, I like to approach every project with a fresh outlook and focus on detail and quality, regardless of budget. D² architect is Donnie Duncanson, an ARB registered and RIAS Chartered Architect, based between the Isle of Skye and Edinburgh, working throughout Scotland. Design is an iterative process - we design, we interrogate and we re-design. I do not see it as an answer to a question or a problem but more of a journey from A to B, where there are many routes to take and unique experiences to garner along the way. So, we prepare ourselves with what we think we need (the client's brief), we inform our journey as best we can (which route to take along the design process) and arrive at one, considered destination (the unique proposal). One college tutor in particular would preach to us not to engage in preconceptions of what something should be - deemed 'post-rationalisation', or as I prefer to think of it, 'closing the gate once the horse has bolted'. Although ritualistically satisfying, it can feel rather hollow - why plan the journey after arriving at the destination? This method of working can also become unproductive but then again, if you know what you want, why expend energy and money planning out other possibilities? The trouble is, we often don't know what we want and little too often does it actually match up with what we need. Sometimes what we think we want is not what we need. A different tack is to allow the process of design to inform the destination, for it is scientifically proven to be way more fun. But seriously, this type of outlook means that design should inherently be unique to each setting - something specific, borne out of context and relevance. This is not to say there's no merit in pursuing an idea; after all, we are often creatures of fashion, prejudice or simply routine, returning to the same holiday spot year after year, climbing the same Munro or taking the same route to work each day. But if we are saying that a design should be unique, how do we then begin the process? Where is inspiration to be found and how can we decide what merits a good idea and what doesn't...? There is a claim to be made that everyone is an architect: we dress ourselves daily, choosing style and form to clad ourselves, and we are aware of how space affects us; large cathedral = sense of awe, insignificance and vulnerability, small snug or living room = sense of protection, warmth and familiarity. We all make choices regarding our look or the spaces we find attractive. So if inspiration can stem from these areas, what then defines a 'good' space...? Perhaps the key is simplicity - perhaps all good things undergo a process of distillation, as any whisky-drinker would agree. Perhaps it is about rhythm and cadence; about how we manoeuvre ourselves; and perhaps it is about tempering and reducing (or distilling) ideas or ‘things’ to their minimum (and odd numbers work best - I tend to find 3 of 'something' generally works quite well). Ludwig Mies van der Rohe professed the famous maxim, 'Less is More' and anyone who has experienced his Pavilion in Barcelona may well agree that absence can indeed be more potent than presence. This was famously demonstrated when large numbers flocked to the Louvre to stare at the empty space on the wall where the Mona Lisa had once hung, following it's theft in 1911. However, it is interesting to note that LMvdR himself lived in accommodation which housed an eclectic mix of varying styles, and not the minimalist modernism he was well known for. It would seem contradiction and eccentricity also form an important, and complex, part of the whole. 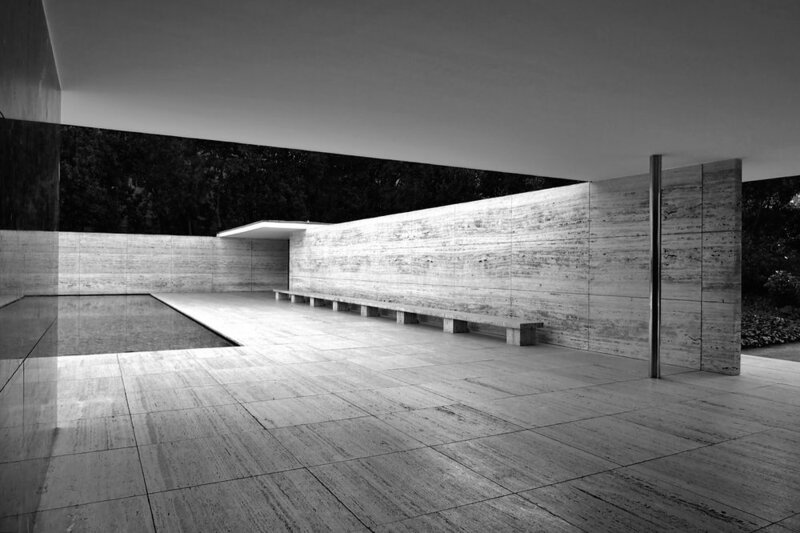 Ludwig Mies van der Rohe, Barcelona Pavilion, Barcelona. The minimal interplay of columns, walls and roof planes create an almost delicate composition, each material thoughtfully considered. It feels like one part museum, one part ancient temple - a place of reflection and contemplation. Culross, Fife. The traditional pantiles ('s' shaped roof tiles) visible on the roofs of many coastal buildings were in fact ballast from returning trade ships, following the transportation of Scottish coal to Europe. Historical and cultural threads can inform modern interpretations and help instruct the tapestry of design. 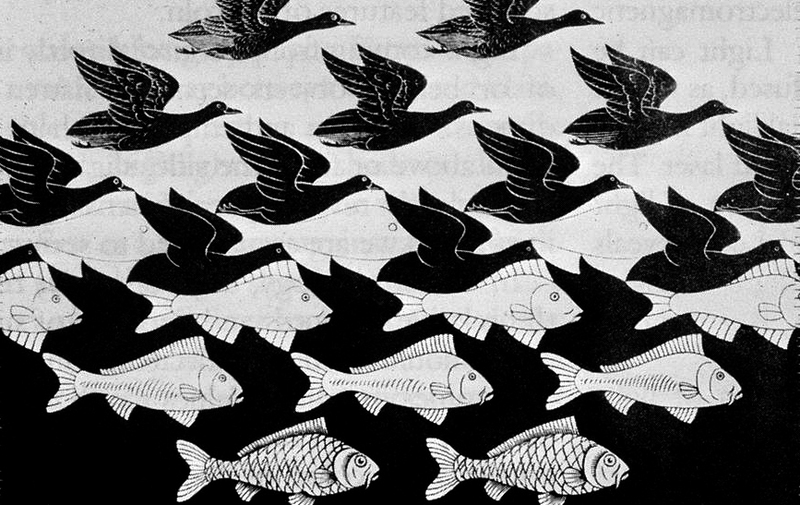 M. C. Escher, 'Sky and Water I' 1938. A joyful interplay of negative and positive spaces - we know what we see at each extreme but the transition blurs our sensibilities. Do we focus on the negative space, or the positive - and at what point does one become the other?